Welcome, fellow traveler, to the world of Stratos! Gather resources, find treasures, alter landscapes, and outwit your rivals. How will you lead your tribe to prosperity? "There's a lot of game to go along with the multitude of bits inside Stratos' box. You'll certainly get your $60 [USD] worth from the game. " "After two weeks of playing Stratos: Light in the Darkness with many different players I tell that this game is capable to take place in collection of really wide spectrum of board gamers"
"I would recommend this game as a reprieve for heavy RPG/D&D gamers or as a solid strategy game for mid-level gamers of all types"
"I found the sheer range of options and the number of possible outcomes quite interesting"
"simply beautiful game ... hell of a lot of tactics behind the scenes ... not the sort of game you would just play once"
""I love the exploring aspect... I want to play again so much, it's not even funny." "If you like Magic: the Gathering, D&D, ... 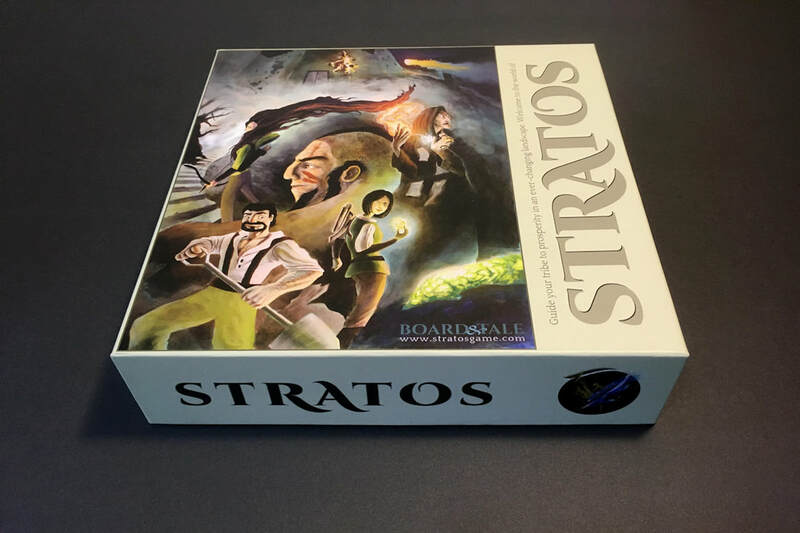 I would absolutely recommend it"
Stratos (core game) is our original 2-5 player version of Stratos. It is currently sold out online. Stratos: Light in the Darkness is a modular product that supports 2 players per box. Orders of 2 or more sets come with sticker sets for labeling different players' character pieces. Black Friday Deals are live! We have also reduced our shipping rates for USA and international customers since we have found a better shipping partner. Learn to play Stratos by watching a basic run-through for 2 players. If you want a leg up for your first match, check out our beginner strategy tips for your first few turns. If you prefer to read the rules, you can find the Instruction Manual and Tutorial below. You'll also find other helpful links to bonus maps, a helpful setup-and-storage guide, player community forum and more! We share our games, memories, and develop new ones to come! Looking for the original Stratos core game? We've sold out online, but you may be able to find it at select retailers in Canada and the USA.